May is National Salad Month! Every month could be salad month in our home because we eat enough of it. Normally, I just make a simple tossed salad or a Caesar salad, but lately I’ve been experimenting with different salad ingredients. I’ve discovered a new found love of Curried Chicken Salad and more recently, this Watermelon and Feta Salad. I wasn’t sure how it would taste since I typically associate watermelon with desserts. I was pleasantly surprised that it was actually quite good. I’ve been craving it daily since I made it! The ingredients are a blend of textures and flavours. 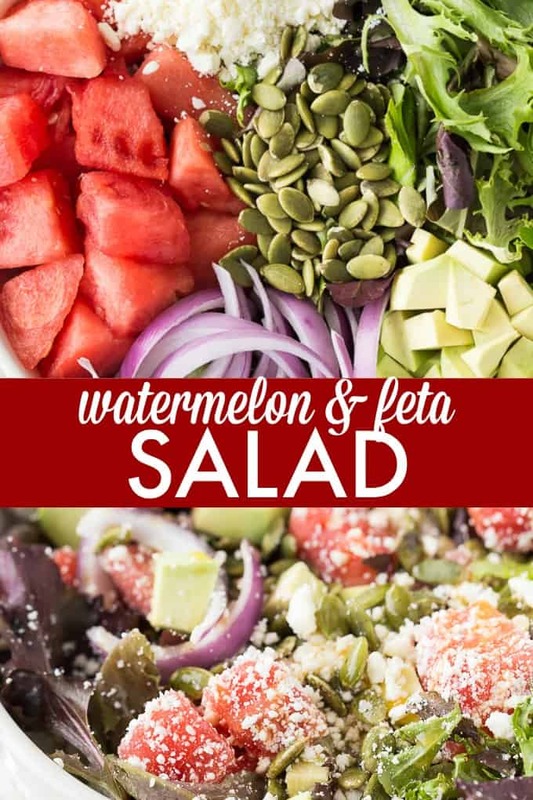 You have the sweet, juiciness of the watermelon combined with the saltiness of the feta cheese. Add some crunch with pumpkin seeds, creamy smooth chunks of avocado and a hint of spice + tang with the lemon/olive oil/chili powder dressing. Together it becomes a mouthwatering summer salad! 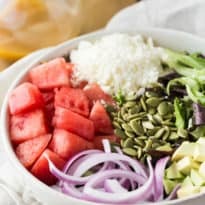 Watermelons are in abundance in the summer so save some pieces and try this salad. It’s delicious on its own as a lunch or pair it with some grilled chicken breasts or steak. I’ll be making this one again and again I’m sure! A fresh summer salad that is delicious on its own or paired with grilled chicken breasts or steak! 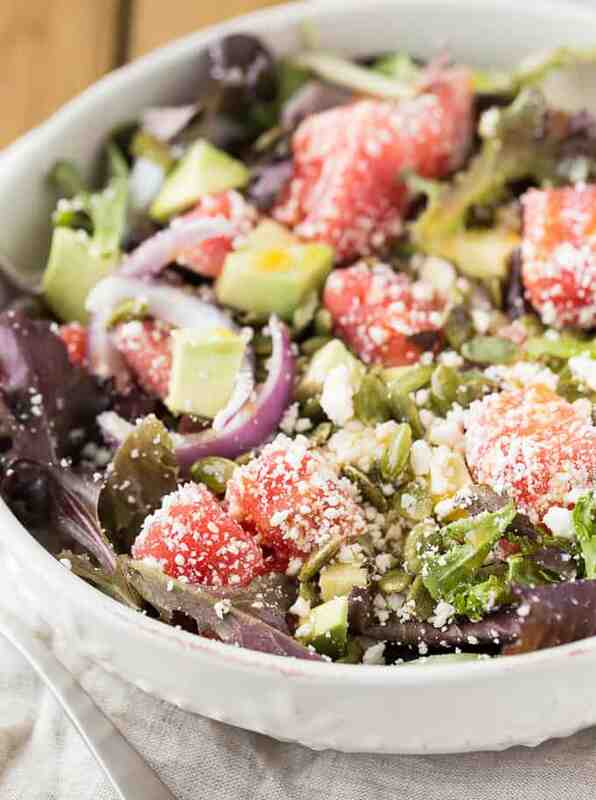 In a large bowl, toss together the watermelon, avocado, salad greens and red onion. Set aside. In another bowl, whisk together the olive oil, lemon juice, chili powder and sea salt. Pour dressing into salad and toss. Add feta cheese and pumpkin seeds to salad and toss together. Great idea for any leftover watermelon, would make an excellent lunch! This looks delicious, I would love to try this. It looks like a nice refreshing salad great for the Summer time. Thank you for sharing this great recipe. I love watermelon. This salad would be so refreshing! 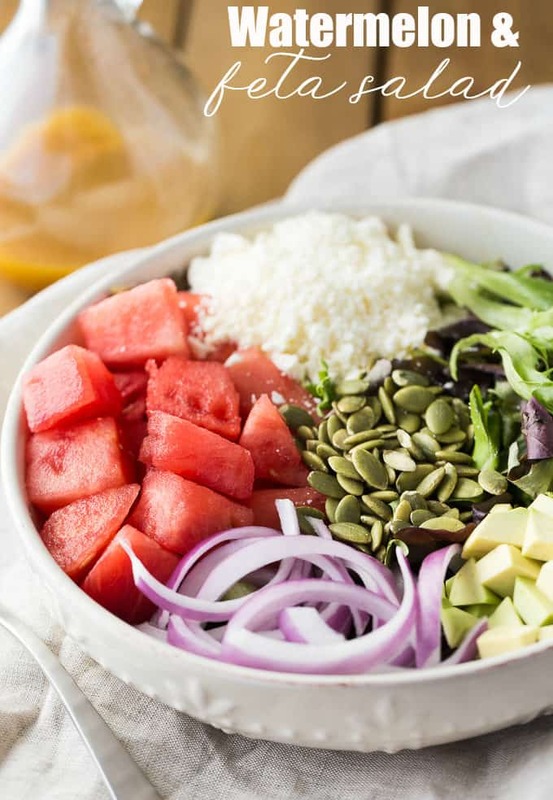 This looks like such a refreshing summer salad! Can’t wait to try it. Thanks for sharing! This looks so delicious! I love how its just perfect for the summer and BBQ season.